The Library has access to a wide range of online databases and catalogues. The collection includes books, journals and standards on all aspects of disability including assistive technology, therapy, social inclusion, human rights and other related areas. For more information visit our online library catalogue. 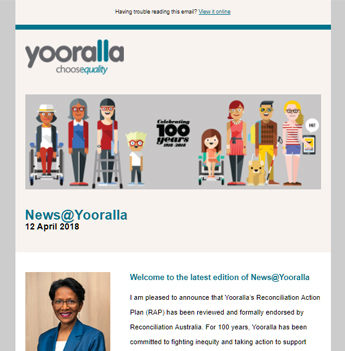 Yooralla recently undertook an assessment of our Communication and Assistive Technology related services and sites to ensure that Yooralla remains viable and sustainable in the National Disability Insurance Scheme (NDIS) market. Consequently, these services will transition to a new service model, meaning the Library will conclude by 14 June 2019. Yooralla’s ComTEC, ILC phone advice and information service, National Equipment Database (NED) support and Therapy services will continue. To find out more about the Yooralla Library, please contact us. Address: Shop C1, Central West Shopping Centre, 67 Ashley Street, Braybrook VIC 3019. To speak to us in a language other than English please call us via the Telephone Interpreter Service on 13 14 50. If you have a hearing or speech impairment, please contact us through the National Relay Service. For information on Independent Living Centres outside Victoria, please visit the Independent Living Centres Australia website.